Update: Warriors coach Steve Kerr said before Tuesday's game against the Timberwolves that he expects DeMarcus Cousins to play on Thursday against the Pacers. Golden State Warriors center DeMarcus Cousins was ruled out of the team's match-up with the San Antonio Spurs on Monday night due to a sore right foot, per Anthony Slater of The Athletic. Cousins underwent an MRI for the foot on Monday, which came back clean, per the team. He will be listed as day-to-day moving forward. Cousins left Saturday's win over the Oklahoma City Thunder in the fourth quarter with what was initially referred to as a sore right foot, as he could be seen limping on the floor. 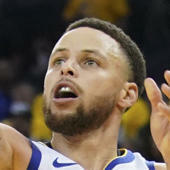 Cousins, who missed the first three months of the season while recovering from a torn left Achilles tendon, returned to Golden State's active lineup in January and has averaged 15.6 points, 7.9 rebounds, and 3.6 assists in 21 appearances with the Warriors. With Cousins sidelined, veteran center Andrew Bogut, who signed with the team earlier this month, is expected to make his season debut against the Spurs. After 13 seasons in the NBA, Bogut, 34, spent the 2018-19 season with the Sydney Kings where he averaged 11.4 points, 11.6 rebounds, and 2.7 blocks per game for the Kings, and was named the league's Most Valuable Player and Defensive Player of the Year. Bogut previously played for the Warriors from 2012-2016 and was a member of their 2015 title team. Now back, he will likely step into a reserve role as the team fights toward its third consecutive championship.